Sea Salt is the fourth most exported product from The Bahamas with almost one million pounds exported annually. It is the largest component of the mined industry. Combined with other mined products – stone, sand, limestone, coral, pebbles, and gravel – they made up 11% of the total value of the top 25 exported products in 2015. 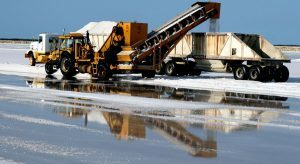 Salt production enjoys a competitive advantage as the island of Inagua, where the salt is ‘solar mined’, is perfect for salt production because the climate is mostly dry. The sun and wind provide the energy that evaporates the water and produces concentrated brine. Impurities are removed by controlled movement of the brine through reservoirs. The process contributes to the growth of an algal mat on the bottom of the reservoirs and prevents the seawater from drying up. Brine shrimp eat the algae, which helps keep the water clean, and flamingos and other shorebirds eat the shrimp, thus producing an ongoing cycle of man and nature working together. The site covers over 300,000 acres on Great Inagua and is the second largest saline operation in North America.